ABSTRACT: The aim of the present study is to evaluate the cytotoxic effect of the ink extracts of different specis of cuttlefish (Sepia pharaonis female, Sepia pharaonis male, Sepiella inermis female, Sepia aculeata female) and squid (Loligo duvauceli female). The ink extracts were prepared by delipidation with acetone and extracted by Tris HCl buffer. The cytotoxic effect of the drug was studied using Trypan blue cell viability assay andethidium bromide /acridine orangestaining. The ink extracts from different species of squid and cuttlefish inhibited cell proliferation and induced cell death in a dose dependent manner. The cytotoxic effects induced by cuttlefish ink extract on chick embryo fibroblast cells involve typical apoptotic changes like nuclear condensation, studied using ethidium bromide and acridine orange staining. The ink extracts from the female Cuttlefish, Sepia pharaonis (25 and 75 µg/ml) showed the highest antiproliferative activity. The results suggested the potent antiproliferative effect of the ink of cuttlefish, Sepia pharaonis on chicken embryo fibroblasts and thereby the therapeutic potential of the ink as an anticancer agent. INTRODUCTION: Squid and cuttlefish come under class Cephalopoda (phylum- Mollusca) which form one of the major marine resources of India. They are exploited mainly for export. Visceral organs including the ink sac form the major waste material in squid and cuttlefish processing industry. Squid and cuttlefish eject ink from their ink sac to escape from their predators 1. The ejected ink functions as a warning signal or alarm substance that confuses predators and alerts conspecifics to the presence of danger 2. Attempts are now-a-days being made to utilize these waste materials to produce bioactive substances such as antibacterial, anticancer and antiviral agents. Cephalopod ink has shown potential antiretroviral activity 3.The peptidoglycan and acetone delipidated ink of squid (Illex argentinus) showed antitumour activity 4 5. The ink and tissue extracts of Cuttlefish and squid showed antibacterial effect 6 7 8 9 10. Measurement of cell proliferation rates are often used to determine the response of cells to a particular stimulus or toxin. Because of the large size of the chick embryo, it is easier to dissect out individual organs to generate specific cell types such as hepatocytes, fibroblasts, cardiac muscle and lung epithelium 11. The present study was designed to investigate the cytotoxic effects of the cuttlefish and squid ink extracts using chick embryo fibroblasts. Extraction of Cuttlefish and Squid ink: Three species of cuttlefish (Sepia pharaonis -female and male, Sepiella inermis -female, Sepia aculeata –female) and squid (Loligo duvauceli -female) were collected from the fishing harbour, Kochi, Kerala, India and brought to the laboratory in ice cold condition. The animals were carefully dissected to remove the ink sac. The ink from different species of cuttlefish and one species of squid were used for extraction. Known weight of the ink was delipidated with acetone at -20oC for 96 h.
The acetone was changed every 24 h after vacuum filtration. The defatted residue was vacuum dried to give a black powder. This powder was extracted with 40 volumes of 0.1 M Tris-HCl buffer (pH 6.8) at 4oC for 48 h, followed by centrifugation at 13,000 x g at 4oC for 30 min. The supernatant was dialysed against distilled water at 4oC for 48 h and then lyophilized to obtain an off-white powder. This powder was dissolved in normal saline (500 µg/ml) and was used as stock solution for cell culture studies. Embryonated chicken eggs: Embryonated chicken eggs were purchased from the poultry farm of the College of Veterinary and Animal Sciences, Kerala Agricultural University, Kerala and brought to the laboratory. The eggs were incubated at 37oC in a humidified incubator till they were nine days old. The eggs were candled to select those with healthy embryos. Preparation of chick embryo fibroblasts and cell culture: Embryos from nine days old embryonated eggs were collected by breaking the eggs under aseptic condition in a sterile inoculation hood. For this the eggs were initially cleaned with 70% ethanol and the broad end of each egg was opened with sterile scissors and the piece of shell with the white membrane underneath was carefully removed. The embryos were removed by sterile forceps and transferred to Petri dish containing sterile Hanks Balanced Salt Solution (HBSS). The head and internal organs were discarded and the muscle tissue was washed with HBSS to remove the erythrocytes. This was chopped into small pieces and again washed with HBSS. The slices were then treated with 0.25% trypsin-EDTA solution and shaken to loosen the cells. The cell suspension was then filtered through cheese cloth to remove debris. The suspension was centrifuged at 5000 rpm for 3 min. The supernatant was discarded and the cells were dispensed in growth medium [DMEM enriched with 10% FBS, Penicillin (100 units/ml), Streptomycin (100 µg/ml) and amphotericin B (2.5 µg/ml)]. The cells were dispensed into T-25 cm2 tissue culture flasks and allowed to become 80% confluent (incubated at 37oC in an atmosphere of 5% CO2). The cells were then trypsinised and seeded into 96-well plates and 12-well plates for viability assay and dual staining (acridine orange / ethidium bromide staining) respectively. Ethidium bromide/acridine staining: Loss of cell viability and nuclear condensation are a result of necrosis or apoptosis 13. Cells (5 x 105 cells/well) were seeded in 12-well plates and the cells were incubated with different concentrations (0, 25 and 75 mg/ml) of cuttlefish (Sepia pharaonis female) ink extract for 24 h. After washing once with phosphate- buffered saline (PBS), the cells were stained with 100 µl of a mixture of acridine orange/ethidium bromide (1:1) solutions. The cells were immediately washed once with PBS and viewed under microscope using a suitable filter 14. Statistical analysis: The data were subjected to analysis of variance and differences determined at 5% level of probability 15. Effect of ink extracts of different species of Squid and Cuttlefish on Chick Embryo Fibroblasts: The graph, Figure.1 showed that the cell viability of chick embryo fibroblasts treated with ink extract from Sepia pharaonis female was decreased to a significant extent in 24 h, whereas those treated with other four ink extracts (Sepia pharaonis male, Sepiella inermis female, Sepia aculeata female, Loligo duvauceli female) showed less significant effect. From the above results, it may be concluded that, among different species of squid and cuttlefish tested, ink extract from Sepia pharaonis female shows the most significant effect on cell viability. 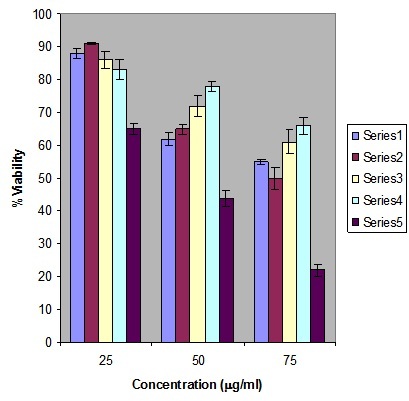 The significant reduction in the number of live cells in the treated samples compared to the control is a clear indication of the cytotoxic effect of cuttlefish ink extract. The extract inhibited cell proliferation and induced cell death in a dose dependent manner. Since the ink extract from the female Cuttlefish, Sepia pharaonis showed the highest cytotoxic activity, further studies were made using this extract. Series 1- Sepia pharaonis male, Series 2- Sepiella inermis female, Series 3- Sepia aculeata female, Series 4-Loligo duvauceli female, Series 5- Sepia pharaonis female . The results obtained in using triplicate samples were taken and percentage viability over control was calculated and expressed as Mean + SD. Each experiment was repeated two times with similar results. Cuttle fish ink extract induces Nuclear Condensation: To see whether the cytotoxic effects induced by cuttlefish ink extract on chick embryo fibroblast cells involve typical apoptotic changes, cells were first examined for changes in nuclear condensation. Control cells showed bright green chromatin with organized structure, indicative of viable cells. Upon treatment with different concentrations (25 and 75 µg/ml) of cuttlefish Sepia pharaonis female ink extract, nuclear condensation was visible in chick embryo fibroblasts at 24h whereas the untreated control cells were healthy with very less staining. The results were shown in Figure 2. Chick embryo fibroblasts treated with 25 µg/ml of cuttlefish ink extract, a few cells lose their membrane integrity and takes up ethidium bromide, which stains orange (mixed with green colour of acridine orange). Chick embryo fibroblasts treated with 75 µg/ml of cuttlefish ink extract the cell loses their membrane integrity and takes up ethidium bromide, which stains orange.Cells undergoing apoptosis exhibit nuclear condensation. DISCUSSION: The cytotoxicity of the melanin free ink of cephalopod, Sepia officinalis was reported 16. Cuttlefish ink finds wide applications in homeopathic medicine (medicinal name ‘Sepia’). In homeopathy it was used to treat hormonal imbalances especially in woman 17. In the present study tris extracted ink of cuttlefish Sepia pharaonis, female showed the highest cytotoxic activity. The antiproliferative activity of the ink extract revealed the cytotoxic effect of the ink extract of cuttlefish Sepia pharaonis. Squid ink has been reported for its antitumour activity 18. The squid ink extract have protective effect towards hemopoitic injuries from chemotherapeutics 19. There is evidence that methanolic extract of squid had anticancer activity. 20. Our investigation also reveals that the ink can also induce nuclear condensation which is the characteristic feature of apoptosis 21. Both chick embryo fibroblasts and cancerous cells are undifferentiated immature cells and they share certain common characters. 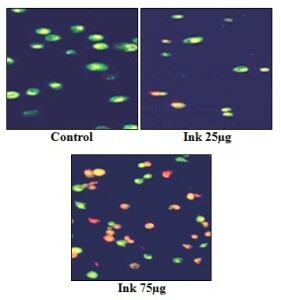 So the cytotoxic effect of the ink extract renders its therapeutic potential as an anticancer agent. CONCLUSION: The result of the present study reveals the cytotoxic effect of the ink extract of cuttlefish (Sepia pharaonis) on chick embryo fibroblasts. The finding renders its therapeutic potential as an anticancer agent. Since the ink is a cheap and readily available waste material of processing industry, it will be meaningful to look at ink as a potential raw material for drug production through further studies. ACKNOWLEDGEMENTS: We are acknowledged to NATP the funding agency for the financial support given. The authors are also grateful to the Dean, College of Fisheries, Kerala Agricultural University, for the facilities provided for the research work. Ortonne JP, Voulot C, Khatchadourian C, Palumbo A and Prota GA: Reexamination of melanogenesis in the ink gland of cephalopods, In: Pigment cell. Phenotypic Expression in Pigment cells(M.Seiji. Ed.) University Tokyo Press, Tokyo. 1981; 49-57. Lucero MT, Farrington H and Gilly WF. Quantification of L- dopa and dopamine in squid ink: implications for chemoreception. Biology Bulletin 1994; 187: 55- 63. Rajaganapathi J, Thyagarajan SP and Patterson Edward JK: Study on Cephalopod’s ink for antiretroviral activity. Indian Journal of Experimental Biology 2000; 36: 583-587. Sasaki J, Ishita K, Takaya Y, Uchisawa H and Matsue H: Antitumour activity of squid ink. Journal of Nutritional Science Vitaminology 1997; 43(4): 455-461. Takaya Y, Uchisawa H, Matsue H, Okuzaki B, Narumi F, Sasaki J and Ishida KL: An investigation of the antitumour peptidoglycan fraction from squid ink. Biology Pharmacology Bulletin 1994; 17(6): 846-849. Annaian Shanmugam, Thangaraj Amalraj, Chendur Palpandi Gnanasekar Devanathan and Thangavel Balasubramanian. Antimicrobial activity of sulphated mucopolysaccharides (Heparin and heparine like Glycosaminoglycans (GAGs)) from cuttlefish, Euprymna berryi Sasaki,1929. Trends in Applied Science Research 2008;3: 97-102. Freshney IR Primary culture, Culture of animal cells. 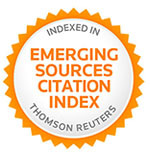 John Wiley & Sons, Inc., New York. 2000. Talwar GP: Hand book of Practical Immunology. National Book Trust. New Delhi. 1974. Duke RC and Cohen JJ: Morphological and biochemical assays of apoptosis. In: Current protocols in immunology. (Coligan JE, Kruisbeak AM. Eds.) John Wiley & Sons, NewYork. 1992. Srinivas G, Anto RJ, Srinivas P, Vidyalekshmi S, Senan VP and Karunagaran D. Emodin induces apoptosis of human cervical cancer cells through poly (ADP-ribose) polymerase cleavage and activation of caspase-9. 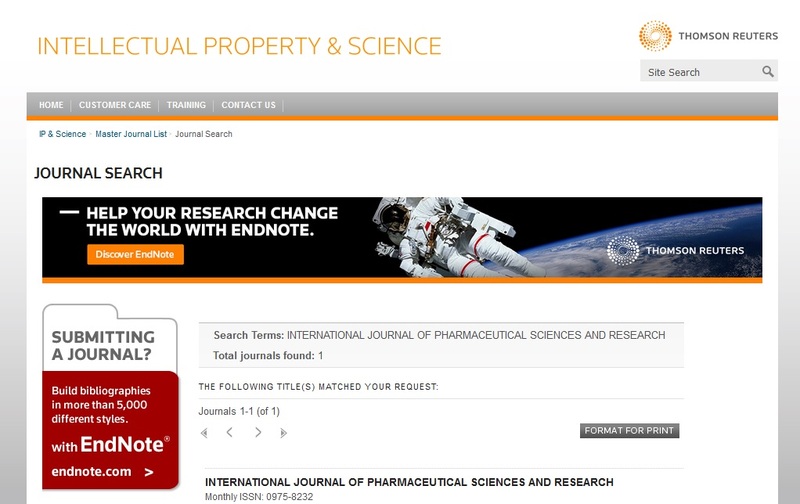 European Journal of Pharmacology 2003; 473: 117-125. Russo GL, Nisco ED, Fiore G, Donato PD, d’Ischia M and Palumbo A. Toxicity of melanin free ink of Sepia officinalis to transformed cell lines: identification of the active factor as tyrosinase. Biochemistry Biophysics Research Communication 2003;308: 293-299. Takaya Y, Uchisawa H, Matsue H, Okuzaki B, Narumi F, Sasaki J and Ishida KL. An investigation of the antitumour peptidoglycan fraction from squid ink. Biology Pharmacology Bulletin 1994;17(6): 846-849. Kerr JFR, Wylie AH and Currie AR. Apoptosis: a basic biological phenomenon with wide ranging implications in tissue kinetics. British Journal of Cancer 1972; 26: 239-257. Senan VP, Sherief M and Nair JR: Cytotoxic effect of ink extracts of Cuttlefish and squid on Chick Embryo Fibroblasts. Int J Pharm Sci Res 2013; 4(5); 1893-1896.